In nearly every type of company, there are employees who are on the road often and can't regularly be in the office. This can include sales representatives, consultants, commercial workers, and more. Individuals who need to be mobile have one thing in common: they're usually on their own when it comes to staying up to date with company information. And information doesn't just flow one way. The mobile app for Linchpin intranets helps such employees in real-life situations get necessary information quickly and easily. This can benefit the entire organization in several ways. An important feature of the original intranet was the sharing and communication of company information with users (top-down). This Intranet 1.0 aspect is still very important to companies today. Company news should reach as many employees as possible (and, most importantly, the right people for whom the message is relevant). With the Linchpin intranet app, companies have a readily-available communication channel. In the app, employees can access important resources whenever, wherever. The mobile solution even takes care of other types of communication: the app alerts users when push notifications are activated. Even those who are working "out in the field" can easily stay up to date with the office. Interacting with others is the same as in the desktop version of the intranet, including features such as likes, comments, and more. Employees who can't always work directly with the team on location, often aren't updated on current topics being discussed by their coworkers. What's happening now in important projects? Where might a coworker need last-minute feedback? Which ideas need to be exchanged? This information is often very important to those employees who are boarding a plane or riding a train when a meeting takes place. Perhaps they also have relevant information they can add. 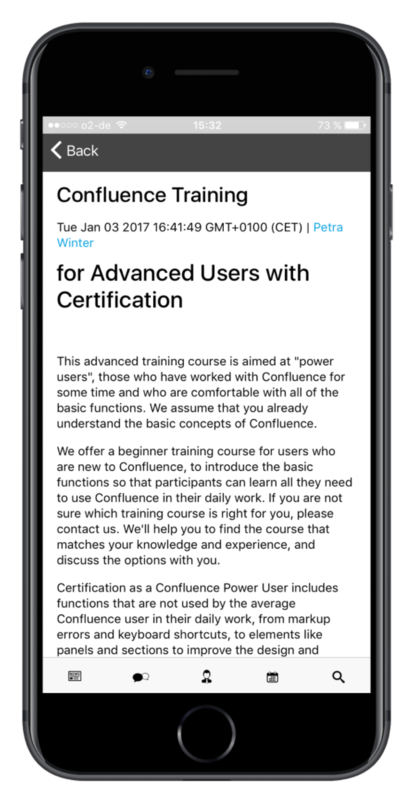 The Linchpin app integrates intranet microblogs. 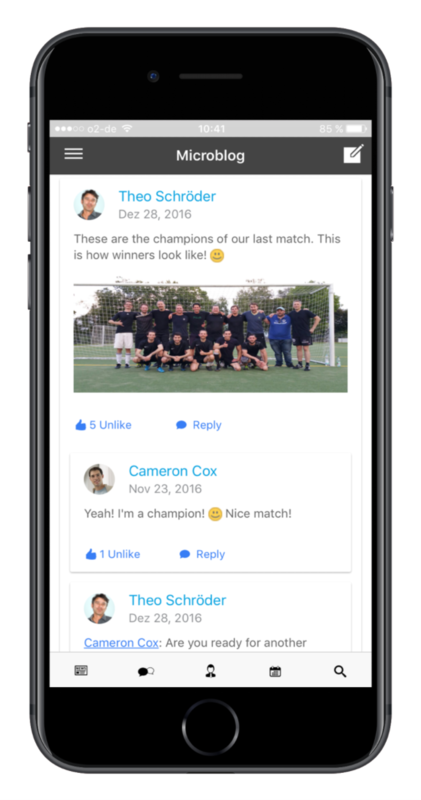 All employees can pull up the mobile app, follow the company's every move, and participate in discussions. This is not just only valuable for exchanging ideas, it can also strengthen the bond between a company and its employees, keeping everyone in the loop, rather than in the dark. Organizations often have a vast amount of events and appointments. Many are directly related to work (meetings, fixed appointments, training, reviews, etc.) There are also indirectly related things, like work committees, informational events, team-building exercises, and other team-related activities, such as a holiday party. Many internal events are also relevant to employees based outside the office. But, such things slip past those who can't regularly check in with their intranets. Traveling team members often get messages about events too late. After two days of business travel, an employee might come back to an already full training session. 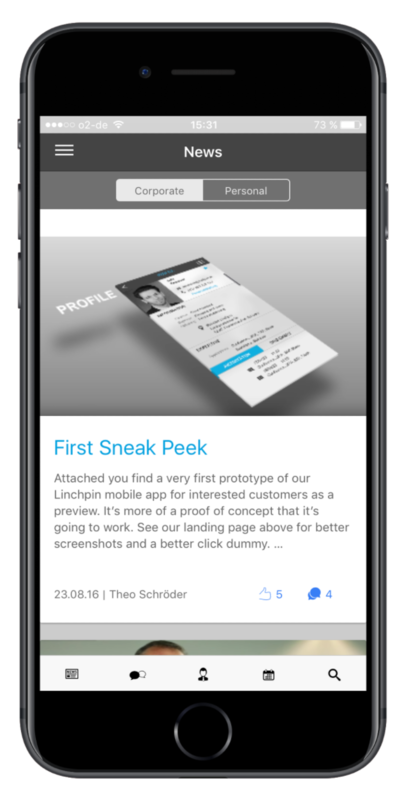 With the Linchpin app, employees have all upcoming appointments at their fingertips, and they can even check-in to events via smart phone. If you're not right at your work computer, it can be difficult to find the right contact to solve a problem or address a situation. It can also be hard to get to know your new coworkers, especially when they started three months ago. There are also times when employees want to access user profiles on the intranet. The Linchpin app makes this possible. Expanded user profiles with photos and all information, contact details, and skills are all accessible from a mobile device. You can also fit the entire company phonebook in your pocket or briefcase - call your coworkers right from the app. For work on the go, the intranet app clearly has a lot to offer. When you install the app on a smartphone, you benefit from time saved and quick access to important information. In fact, the Linchpin mobile team employees did an estimate in order to see how much time was saved for each individual using the app. Would you like to experience more? Currently Linchpin Mobile is in development and has just been released to us internally as a beta. You can find more information on the project and its background in our info page. Are you already a Linchpin customer and want to take part in its development? If so, let's talk! A regular project could open the door to special licensing deals, co-designing, and other benefits.